How Do You Determine the Price of a Condo in the Optima Camelview? As Scottsdale real estate professionals specializing in Old Town Scottsdale condos and, more importantly, having a strong presence in the Optima Camelview condos, we are often asked the question of “why is this particular Optima Condo more expensive than this other one?” If you look at Old Town Scottsdale condos, prices are all over the place, which people expect, but when looking specifically at Optima Camelview condos for sale, buyers are often shocked to see the large price differences, even among units that have similar square footage. Terraces – Whether you call them terraces, balconies, or patios, they’re important. These terraces can greatly vary in size, anywhere from 25 square feet to over 1,000 square feet. Some units even have two! Mountain Views – The Camelback is surrounded by mountains including the infamous Camelback Mountain. Units that have great views of the mountains can be very desirable. Pool Views – Having great views of either of the well manicured two outdoor pools can be a huge plus. Being able to sit on your terrace or in your living room and look out at the sparkling blue water amongst all the foliage can really make you feel like you’re living in a resort. Traffic Noise – This holds true for the pricing of most Scottsdale, AZ homes for sale. If there’s a lot of traffic noise the home is generally going to be worth less. Accessibility – The Optima Camelview is full of twists and turns. While being in the heart of it may have its advantages, it can also be very difficult to obtain food delivery. With Amazon packages being delivered to The Optima Concierge, having to trek packages hundreds of feet through winding turns can be a burden. Natural Light – Being in a vast garden means that some units get a lot more sun exposure than others. This is extremely subjective as some people love the sun shining through their windows in the mornings, others despise it. Walls of Windows – One of the greatest selling points of the Optima are the floor to ceiling windows. Units that have two living room walls with floor to ceiling windows often times end up feeling much more open and overall a lot larger. Layout – When building condos as large as the Optima its hard to have every square foot of space perfectly laid out. Some units have quite a bit of square footage that feels overall unusable. Remodels – This is another one that’s true for all Old Town Scottsdale condos, and really all real estate for that matter. In the most recent years (and really just year) lots of units have began to get remodeled with modern gray tones and straight lines. Penthouses – Units on the top floor of The Optima in Old Town (this usually means the 7th floor) are considered penthouses. While the floor plans and finishes aren’t necessarily different than the other units found in The Optima, not having anyone above you can be a huge benefit when it comes to condo living. These units also often have larger terraces and less walls adjacent to other units because of these larger terraces. This brings us to our next bullet point, terraces. 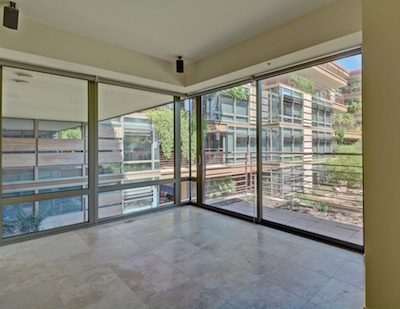 As Scottsdale Realtors that specialize in The Optima, we see tons of Optima Camelview Condos for Sale every week. If you have any questions about pricing your Optima Condo please contact us by calling or texting 480-387-3990 or filling out our contact form. 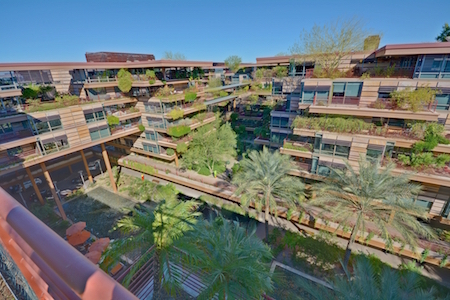 You may also be interested in viewing all Scottsdale condos for sale. View all condos for sale in Optima Camelview Village. Please leave comments below on what other factors you believe play into the price of condos in the Optima. Coming Soon: NEW Listing in Gated Old Town Scottsdale Community! Check Out our NEW Listing in Scottsdale Springs! Be The First to See Our New Optima Camelview Village Ground Floor Condo for Sale!